On a shoe-string budget and with tape recorder in hand, Kairol Rosenthal emerged from treatment and hit the road in search of other twenty- and thirty-something cancer survivors. 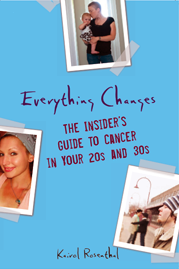 From the Big Apple to the Bible Belt, she dusts the sugar coating off of the young adult cancer experience, exposing the gritty and compelling stories of twenty-five complete strangers. * Reader Reviews – click here. * Browse Inside The Book – click here.